LOS TWANG! MARVELS Are breaking through to the Outer Space with Guitars in Orbit, their debut CD on El Toro Records Reverb Series. Taste the exotic chords of this lovable combo, they rock! Presently living in Germany, the two Marvel guitarreros, Marisol Yolanda and Alex Christian Anthony, initiated the band in summer 2000, trying different line-ups until the needed fuel & fire was found to make the audiences explode and dance beyond limits. In their endless pursuit of good music, they throw in atin melodies mixed up with the spaciest of surf´n´roll and blends of euroinstro, rescuing from the forgotten dimension Uruguayan-Argentinian legends Los Iracundos, Los Bambis, Bingo Reyna and many more as well. What is being said of Los Marvels: "Los Straitjackets were recently in Mexico City and during a radio interview we were asked if we ever see other surf instrumental bands that we like. Danny (Amis) and I both exclaimed 'Los Twang! 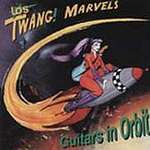 Marvels'" (Eddie Angel) "In-car listening of the evening: Latin Surf by Los Twang!Marvels. Superb. Very well played, humorous & enough to make the legs snap like whipcords." (Robert Fripp) Enjoy the ride, see you in Orbit!